Hebrew prayers to Mary from 1759. Talk to the hand, or the hand talks to you? A guide to Palmistry. You can read or download it here. * The actual work is a reprint of a 1658 work. The Yiddish is added to the 1776 edition. Here's an interesting review of the Jerusalem Bible (edited by Prof. Moshe David/ Umberto Cassuto) published in משמרת חומותנו in 1956. Click the images to enlarge. The tenor of the article is contempt that unbelievers are involving themselves in a job that is not theirs, by producing a Bible. This edition is edited by "some professor" and the title page proclaims that it is according to the Masorah of Ben Asher. It goes on to explain the Masoretic studies is all but a lost art, but nevertheless the greatest sages were proficient in them, including in recent times. It is they and they alone who took great care to investigate and preserve the correct text down to the letter. It gives a basic overview, starting with the relevant gemaras, Rambam, and the leading masoretic scholars throughout the ages. It then derides the use of "random" manuscripts from "random genizas," which disagree with the pesak halacha, the accepted rulings. This is kefirah. The author is particularly bothered by the claim on the title page that it makes use of manuscripts and represents the masorah according to Ben Asher. But we cannot improve on the accepted text established by the great sages, who used very exact manuscripts. So what if they found new manuscripts according to Ben Naftali or which otherwise contravene halacha? The editors err further when they write that they did not make use of the scrolls found by some Arabs near the Dead Sea, because "It is still unclear if these texts are older than the masoretic text." That is, they don't rely on the masorah because they believe in it. They use it like an archaeologist, and are trying to establish which is the oldest text. Therefore they are untrustworthy, because they don't believe in the truth of the Torah and the received masorah. The Sedarim of the Triennial Pericopes exhibit the second division of the text. The Grammatico-Massoretic Treatise which precedes the Yemen MSS. of the Pentateuch distinctly declares that the Sedarim are the Pericopes of the Triennial cycle which obtained in many communities. "There are," it says, "places where they read through the law in three years. Hence the Pentateuch is divided into one hundred and fifty-four Sections called Sedarim, so that on Seder is read on each Sabbath. Accordingly the Law is finished at the end of every three years. He continues to explain that as this was a very old practice, almost no manuscripts give the sedarim, although they generally do state at the end of each book how many sedarim are in it. He quotes Jacob ben Hayim's introduction to the Second Rabbinic Bible (commonly called Mikra'os Gedolos) where he states that if he had access to a list of the sedarim then he would have followed it, instead of the Christian chapter divisions! Eventually he did discover such a list, but only at the end of all his work, so it was printed separately (at the beginning of the Bible) rather than incorporating it into the work itself. As you can see, he felt that this is valid masoretic information, and it should be printed so that it isn't lost. Actually, he would have marked it in the Bible itself instead of the Christian chapter divisions. As for the samech marking, this is not Ginsburg's innovation, but he followed a certain manuscript (British Museum Or. 2201 (1246)) which not only contained a list of the sedarim but also marks each one with a samech, which is important because it shows that it agrees with its own list and leaves no doubts. It should be noted that while the critique we are discussing is opposed to using "random manuscripts," this is not a random manuscript. It is a Spanish manuscript of the kind described by the later pillars of the masorah as "very exact and corrected." (Chapter IV of Ginsburg's Introduction to the Massoretico-Critical Edition of the Bible pp. 32-35). It then points out that "anyone who knows a little bit about printed Bibles" will realize that this edition is a facsimile of a missionary Bible (i.e., Ginsburg). This Bible however imposed its corrections on top of it, which meant that the original had to be literally cut up and mounted to be edited and photographed. If so, it is impossible for them to not have erased God's name many times, since it is printed on both sides. Imagine, that this Tanach was produced by erasing God's name hundreds of times! As an aside, I don't know who gave them a heter to use Arabic numerals. What on earth is "7 המשך בעמוד"? He then gets to "the main point" which is changes in Tanach itself. He gives one example, but says there are many more. When all is said and done, how brazen some professor is to allow himself to decide against many books and decisors. How chutzpahdik of him to change the nusach of the Torah in such a way that would render a Torah passul! (I would note that all Chumashim are filled from beginning to end with things that would make a Torah unfit.) A second example is in a word in Isaiah, where the Radak writes that there the books disagree on this particular word, with most writing it as two separate words. On the other hand, a minority write it as one, which agrees with Targum Jonathan's translation. Yet Cassuto goes against the majority and wrote it as one. He must have extra special inspiration to know how to decide this. Furthermore, by doing this he is also impugning all the other Bibles which write it as two words. He gives one more example, and then he concludes by citing Psalm 50:16, "What hast thou to do to declare My statutes, and that thou hast taken My covenant in thy mouth?" In a nice piece or irony, the writer actually changes the masoretic spelling of a word in this verse. חֻקָּי is written defective, and he writes it חוקי! All in all it is a substantial critique, even though it is filled with invective that I think most readers of this blog will regard as insubstantial (such as negating the right of Cassuto to edit a Bible). Of the Codices of Cairo, London and Leningrad I have with me complete photographs, and of that of Aleppo as much as I could copy at the place. I don't know much about this Bible, although I know that it was not well received in the community of Bible scholarship either. Someone told me that he obtained a copy having found one in a shemos box in a shul. He asked the rabbi's son if he could take it, and after looking at it the reply was "Cassuto? Doesn't sound very Jewish. I have to see." In other words, he was only willing to let him take this discarded Tanach if he could be sure that it was a kosher edition. Having received such an assurance from his father, he let my friend take it. 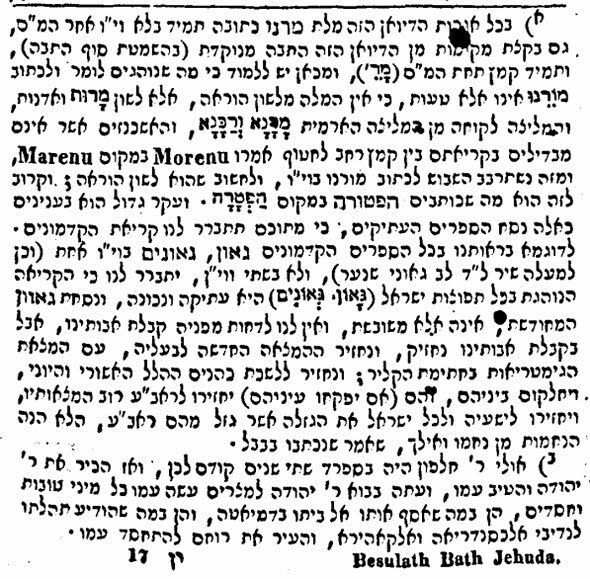 An English abstract of the Shemoneh Esrei from 1706. 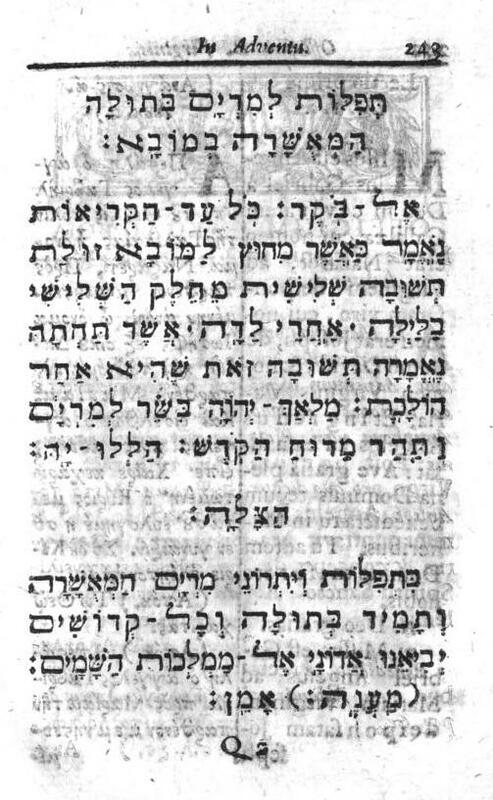 Here's a description of the Shemoneh Esrei/ Amidah prayer from 1706.
by Isaac Abendana (1640-1710). Isaac Abendana was the brother of Jacob Abendana, the Haham of the Spanish-Portuguese Jews of London. This "Learned Jew" also translated the entire Mishnah into Latin, although it was never published. 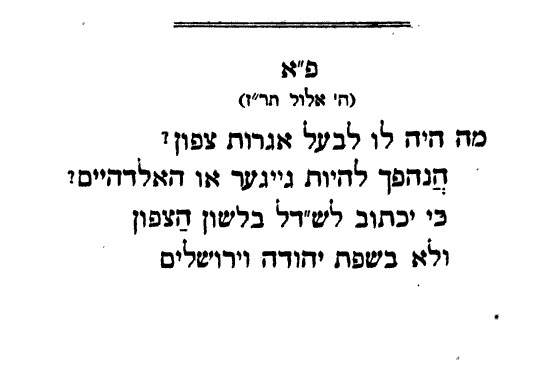 An 1839 critique of the ability of yeshivas to train and produce rabbis. 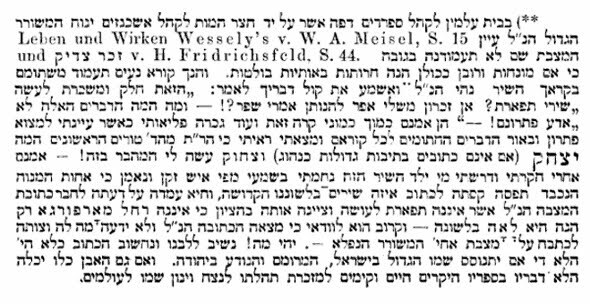 Here is an interesting caustic comment concerning yeshivas in R. Hirsch Fassel's Choreb be-zayon, his critical "Letters of a Jewish rabbi and scholar" on R. Samson Raphael Hirsch's Choreb. "Today, although this problem is gradually being lessened, young man will have to form themselves into rabbis. But where shall this be done? In Yeshivos? There is there one thing taught which actually pertains to the rabbinate? Everything there has a polemical tendency, and the most one can get out of it is perfecting Dialectic - but what else? Not even Casuistics (i.e., the study of responsa) or practical halacha, let alone exegesis and hermenutics, homiletics and rhetoric. A youth spends many years in the Yeshiva and all he has to show for it to belong to the rabbinate is to teach himself everything, becoming an autodidact." Inadvertently blaming Wessely's sister, who "was no Rachel Morpurgo," for someone else's plagiarism of an unfortunately mismatched tombstone acrostic. 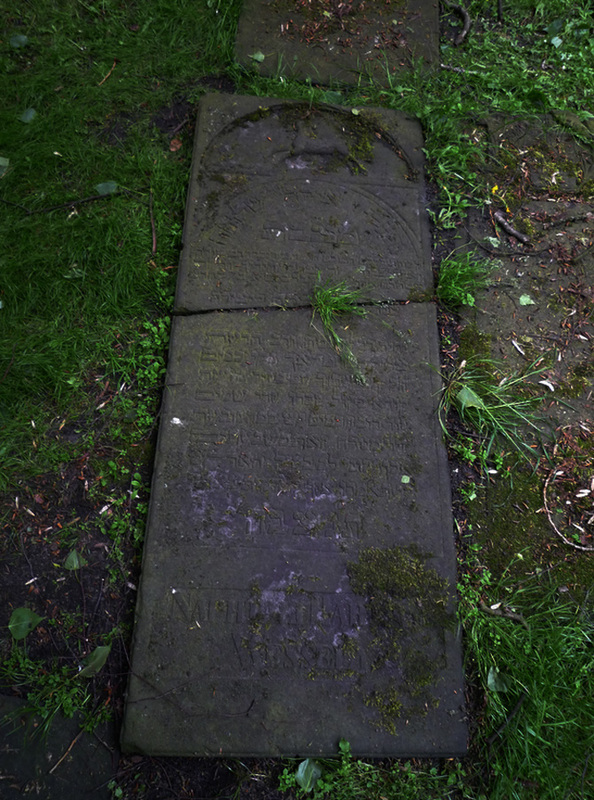 One section of the book includes 40 gravestone inscriptions of rabbis and scholars from the Altona cemetery. For example, to name those probably most recognizable to readers, it contains the tombstone inscriptions of R. Meshulam Zalman Mirels, R. Yechezkel Katzenellenbogen, R. Yonasan Eybeschutz, R. Yaakov Emden, R.Mordechai Gumpel Schnaber, R. Rafael Kohen, R. Mendel Frankfurter, R. Yaakov Ettlinger and R. Isaac Bernays. The only non-notable name inscription is #38, which is included because it is the oldest one in the cemetery, dating to 5381/ 1721. You can well imagine how edifying it is to sit in a comfortable chair and read grave inscriptions. As you can see from the inscription, the poem is actually an acrostic which reads יצחק - Yitzchak! (יצחק עזאל, actually, or יצחק עוזיאל if you include the second letter in the words עוד and זיוי, as you are surely supposed to.) What gives? s Sephardic Hebrew Epitaphic Poems" by Marian and Ramon F. Sarraga in Jewish Studies Quarterly 12 (2005) pp. 366-69. They explain that this was a recycled poem. Written in the 17th century by Joseph Franco Serrano in honor of Rabbi Isaac Uziel (d. 1622), one of the most prominent personalities buried in the Beth Haim cemetery in Amsterdam. The poem was included in David Levi (Miguel) de Barrios' 1683 book Triumpho del Govierno Popular in the section called Vida de Ishac Huziel. The poem was also printed by Jellinek in the Lit. des Orients 8 #18 pg. 276 - 77 (link). It's always good to look at different versions of the same thing, very edifying. Jellinek incidentally interprets the acrostic, the hidden "Uziel" slightly different from me, but I am right. 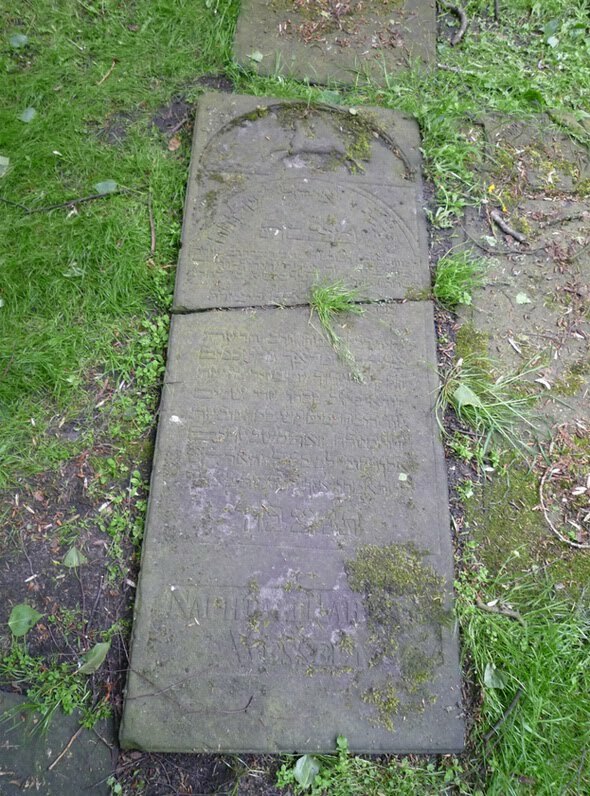 In the case of Wessely, some say that Abraham Meldola one who "composed" it, that is, who is responsible for its reuse on the grave and that he actually claimed credit for it, that is, he plagiarized it (he was a putative student of Wessely, who printed a Hebrew/ German dirge for Wessely called קול הצירים תחת השיר/ Eine hebra¨ische Trauer-Rede . . . (Altona 1805). I haven't seen his book, but the Sarragas say that although his book does say Dessen Grabschrift verfertiget durch Denselben ("[Wessely's] epitaph prepared by the same person" (i.e., Meldola) its possible that he only meant to take credit for the German version of the poem included in his pamphlet. But even if so, he also did not write where he got it from, so I guess that counts as plagiarism. Pretty wild when you consider that the blasted acrostic just keeps on spelling "Yitzchak Uziel," no matter how you slice it, although of course the letters are not engraved in a larger font. Interestingly enough, in the version of the epitaph printed in the Sarragas article, which comes from Meldola, there is a tiny difference from the version printed by Wittkower. 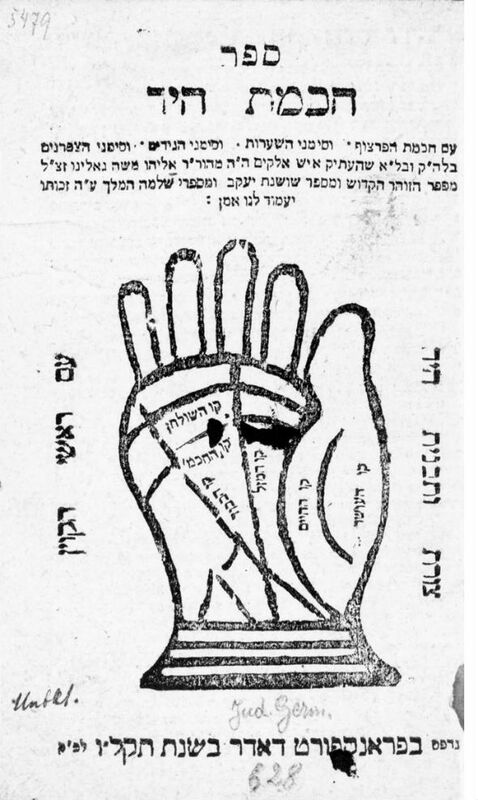 Wittkower has המשורר האלקי, while Meldola printed המשורר האלדי. I guess Meldola should know since he prepared it for the grave! As it happens, if you view the photo of the faded gravestone at its highest resolution, and play with the contrasts in Photoshop you can see that האלדי is absolutely correct. Meldola says he prepared it. No doubt he did. But naturally others had additional details. 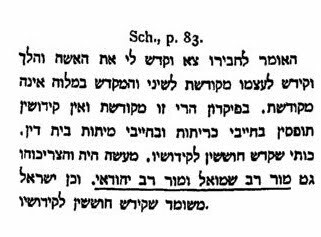 In Wittkower's footnote he makes note of the problematic acrostic "Yitzchak" - he didn't realize it also says "Uziel" - and he says that it really bothered him. Was this the lot of author of Shire Tiferet ? Is this a proper memorial for this נותן אמרי שפר? Was "Yitzchak" someone's idea of a joke? So he says that he inquired and eventually an old man, who was reliable, explained the riddle to him. He told him that it was Wessely's sister who endeavored to make sure that some Hebrew verse would appear on his tombstone, and suffice it to say, she was no Rachel Morpurgo! Not getting anywhere with the versifying herself, she must have found this written somewhere, didn't recognize it as an acrostic and ordered it engraved on the stone of her expert poet brother. Wittkower says this account is קרוב הוא לוודאי, "almost certainly what happened." Actually it's possible that this is the truth, only Wittkower's old man didn't know where she got the text. She got it from Meldola, who messed up. Finally, the Sarragas inadvertently revealed another error on Meldola's part. He didn't realize that the poem contains another acrostic. They printed the following vocalized version from a 1768 manuscript by Isaac Belinfante. As you can see, the way he wrote it the second column forms "ונבע בכבד." Although they feel it may be a coincidence, there's no such thing as a coincidence, right? Here is a beautiful new Hebrew blog called Notrikon. The blogger is affiliated with the Kedem auction house, where the very interesting items he discusses are from. So while it obviously is promotional for the auction house, it is most definitely a very real blog, similar to mine, actually, with interesting and informative posts by a blogger who knows his stuff. Since Notrikon is in Hebrew, for readers who prefer English, Izgad (izgad.blogspot.com) recently began a literary blog called Tipsy on Books: Dispatches from the Tavern. Similarly, Izgad is now employed as the Judaica cataloger for Eric Chaim Kline, Bookseller, and his posts are about treasures and curiosities from his employer's inventory. But this blog too is a very legitimate, interesting blog in its own right and I would say that its commercial connection is irrelevent. I stress that this post itself is not an ad or even a favor to these two bloggers. These are two very good new blogs that are worth your time and mine. A method of dehumanizing Siberian prisoners described in an 1853 anti-Reform responsum. The Jewish press arose more or less in the 1830s (link). 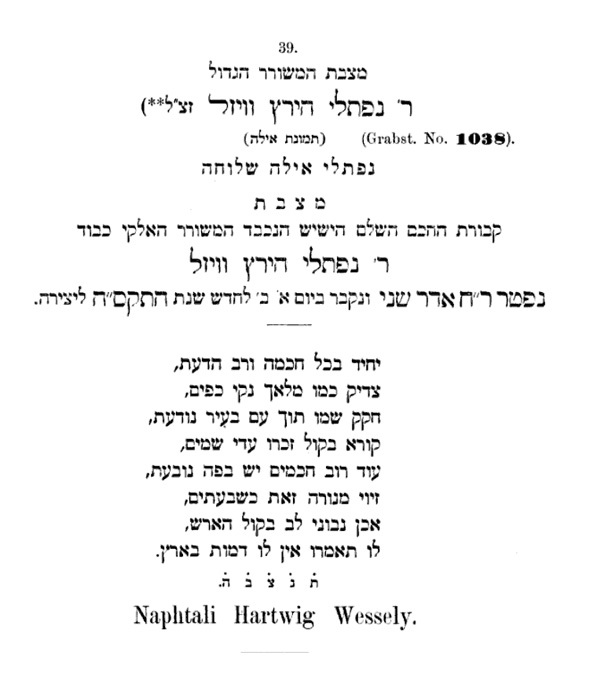 What the Jewish Encylopedia calls "the first successful Orthodox paper was "Der Treue Zionswächter" (1845-55), with a Hebrew supplement, "Shomer Ẓiyyon ha-Ne'eman." Its founder was Rabbi Jacob Ettlinger, although he was not the editor. The name of Rabbi Ettlinger and the editor Dr. Joseph Enoch appear on the masthead of the Hebrew section, the aforementioned שומר ציון הנאמן. This was published bi-weekly and, according to Judith Bleich, 220 issues were printed (each with roughly 4 pages). Naturally you can find bound editions in libraries and in 1962 an edition containing all of them was printed. Most of them are on hebrewbooks.org. This Hebrew literary journal featured writing by the famous and non-so-famous Orthodox rabbis in Germany (and even Hungarian rabbis like R. Moshe Schick) on a variety of topics, ranging from responsa, to chiddushim, to polemics, to poetry, to educational concerns, as well as news. In any case, in the responsum on synagogue Reforms, he answers three questions. Is it permitted to use an organ on Shabbos? Is it proper to summon people to the Torah by means of a card (קארטען) instead of calling them by their Hebrew name, א ben ב? Is it proper for the synagogue gabbaim to hush people and prevent them from praying loudly and with intensity? You know what the answers are. I thought the reference to Siberian prisons and the dehumanization of prisoners by only calling them by number was interesting. The medal he is wearing in the second picture, from 1861, signifies his being awarded membership by the Prussian king in the Order of the Red Eagle, fourth class - whatever that means. Shadal series #5 - What does Morenu really mean? In Julius Furst's Der Orient (Literaturblatt des Orients No. 7, February 15, 1840) pg. 108 we find the following short note by Shadal asking a very fair question: Was the rabbinic title originally מוֹרֵנוּ, that is "our Teacher," or מֳרֵנוּ, that is "our Lord?" Shadal says that of course we find Morenu (מורנו) all the time, but the question arises from older manuscripts where there is something which gives rise to his question. For example, in Rabbi Yehuda Ha-levi's Diwan (a rare manuscript which he purchased and was about to publish) we always find מרנו (lacking a vav). Sometimes we even find it abbreviated and including nekkudot, like this: ' מֳרֵ. He points out that very old manuscripts sometimes have older readings, so such things are not mistakes at all. In fact he concludes that this is the primary reading, and we see from this that the term מורנו is really מֳרנו and derives from the word denoting lordship rather than teacher. The term actually comes from the Aramaic phrase מרנא ורבנא, where the absolute form of the word is מָר, master, not מוֹרֶה, teacher. The "German-Polish" (Ashkenazic) pronunciation of the kametz with each failure to differentiate between the two kinds of kametz lead to the pronunciation as Morenu, rather than Marenu. From this it was but a small step to spell it maleh with a vav, מורנו, and this implied that the word means to say "Our Teacher." This is essentially what happened with the word haftarah (הפטרה) which is often pronounced and written haftorah (הפטורה), but there is no doubt whatsoever that the correct reading is the former. Shadal included this, slightly expanded, as a footnote to his edition of the Diwan (link), which I will get to soon. He says that there are those who write it מֹר, but this must be a mistake, because if this were the correct reading why not [ever] write it with a vav? The answer to his objection is that they definitely do write it with a vav, he just never saw it. 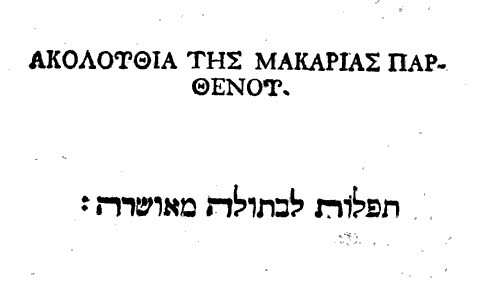 If you don't find it in your copy - it is spelled מר rather than מור in the Bar Ilan database - it's because later editions corrected it, but this is how Bertinoro always spelled it (or at least how it is spelled in the earliest printed editions). The first is a description of a manuscript in Ohel Dawid, the catalog of the Sassoon collection. The second, below, is from Halakhot Pesukot. There are many more such examples, including the Sefardic rescension of Iggereth Rav Sherira Ga'on. Thus we see that Shadal did not seem to realize that pointing with a holem (Mor) is undoubtedly possible. Practically speaking I'm nor sure what difference that makes, since he'd be right in any case that it meant "master" and not "teacher." Actually the Sefardic pointing supports him. Interestingly one can find a clear support for Shadal in Rashi on Kiddushin 31b which discusses the proper way a person should refer to his father. Rashi ד"ה ואמוריה explains אבא מרי to mean אביו ואדוניו. Not only that, as it happens in our texts of Rashi מרי is written with a vav, מורי. I will leave it to the text experts to get to the bottom of it and determine if this is the correct reading of Rashi. Incidentally, Soncino translations מרי as "teacher" and Artscroll translates it as "master." Also see Rashi Bava Kamma 49b where he gives the exact same translation for מורי (this time the Gemara reads it with a vav). 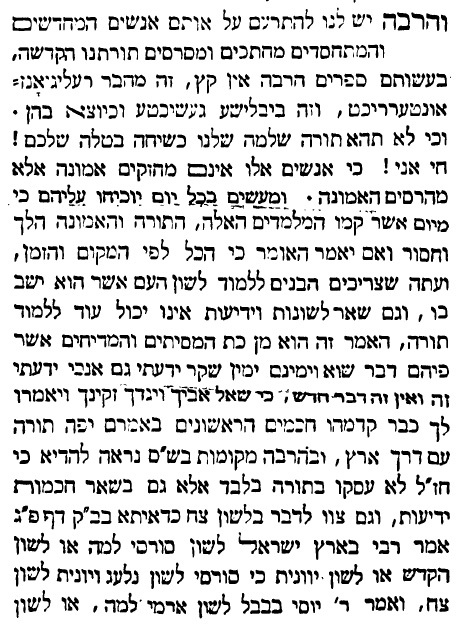 Interstingly enough in the 2005 edition of the Tishbi there is a note in this entry by Rabbi Meir Mazuz which says that he heard from his father R. Mazliach that the Ashkenazic reading "Mar" is correct, but the Sefardim changed it to "Mor" because "Mar" connotes bitterness. And, I would add, "Mor" means "myrrh." Actually, he brings a quotation from the Tikkunei Zohar which makes a play on "Mor" as both "master" and "myrrh," which implies that the Zohar (*coughSpaincough*) read "Mor." (Link; this wordplay is very sbutle, but I agree with him. It is a nice catch. Almost as if sensing that the wordplay doesn't really work with Ashkenazic pointing, the editor of this 1909 edition with nekkudot doesn't point "Mar," seemingly the only unpointed word on the page! That's pretty cool, except that he was Sefardi. צ"ע.) I also want to point out that this edition (Machon Harav Mazliach 2005) is the one to get, if you ever wanted a Tishbi. The only criticism I have is that for some reason they changed R. Elijah's unique vowelization of many of the entries, a major major error on their part. I can't begin to fathom why they did that, and if they had to do it they should have noted each change in the notes. Apart for that, it is simply the edition to own with its manifold notes and supplements. I would just note that the typesetter spelled the book Besulath Bath Jehuda, as you can see. In other words, in the same word (בתולת) he renders a תי"ו רפויה as /s/ and also /th/. That's enough to drive a pedant crazy. 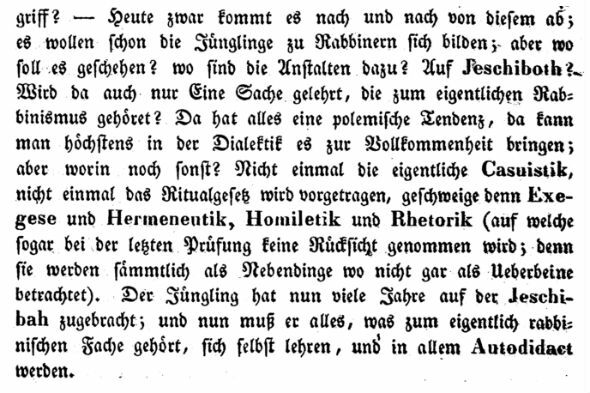 In this footnote he expands his thought, mentioned only briefly in German, that we have a great source in old manuscripts to teach us how the ancients read, and from this we can learn many things. He gives another example which I admit that I find puzzling. The example is גאוון, which he says is a faulty modern spelling, for in old spellings it is always גאון with one vav. He says that the old readings prove that the traditional spelling with one vav is correct. I think I'd have a better idea of what he was getting at if I could find many examples of "גאוון" in print but I cannot. So I'm not sure which moderns he has in mind. I guess unwittingly his own writing became an example of what he is talking about. We now see that in 1840 people were spelling it "גאוון," evidently a passing fad. Did the "Vilna Gaon's 'rebbe' the Pnei Moshe enroll in a university to study botany? Here's the abstract: did Rabbi Moshe ben Shimon Margolis (circa 1710-1780) author of the Pne Moshe/ Ma'areh ha-Panim commentary on Talmud Yerushalmi, and reputed rebbe/ tutor of the boy who grew up to be the Vilna Gaon, actually enroll in a course on botany at the University of Frankfurt-an-der-Oder? As the title indicates, there is a phenomenon of facts that may not be so factual, yet which get repeated so often they become fact. One such example is the following: Rabbi Moshe Margaliot (d. 1780), author of the Pne Moshe commentary on Talmud Yerushalmi and a rebbe/ tutor of the child who would grow up to the Vilna Gaon, enrolled in the University of Frankfurt an der Oder when he was middle aged to study botany so that he could better comprehend the agricultural content of the Jerusalem Talmud! 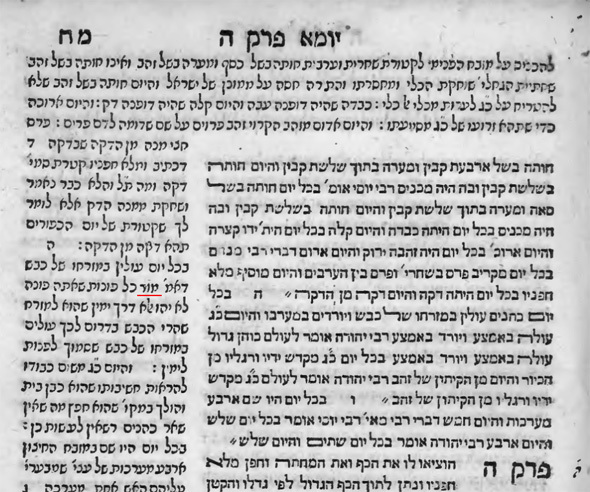 Apparently Margolis used manuscripts to clarify textual variants and spent no little time in the Department of Botany at the University of Frankfurt an der Oder in order to prepare himself for the composition of his commentary on Seder Zera'im. "We know very little about the life of the great commentator on the Palestinian Talmud. I shall, however, mention one very interesting fact about him. On August 11, 1779, shortly before his death - he must have been about seventy! - he registered under the name of Moses Margelit (in his native country he certainly pronounced his name Margolis!) as a student of botany at the University of Frankfort-on-the-Oder. One is safe in assuming that his eagerness to acquire botanical knowledge was prompted by his desire to be better prepared for the study of the first order of the Palestinian Talmud, which deals chiefly with agricultural laws, for the understanding of which some botanical knowledge is indispensable. For the same reason "the Gaon of Wilna" had spent some time with farmers, for in Poland no opportunity was given to a Jew to register at a University." There are a lot of assumptions here! But one thing seems clear-cut, given that the exact date of his registration is known. But how do we know it? And is "Moses Margelit" indeed the 70-year-old author of Pnei Moshe? How do we know that? "According to the records of the University of Frankfort-on-the-order [sic], on August 11, 1779, an M. Margoliot enrolled as a student. 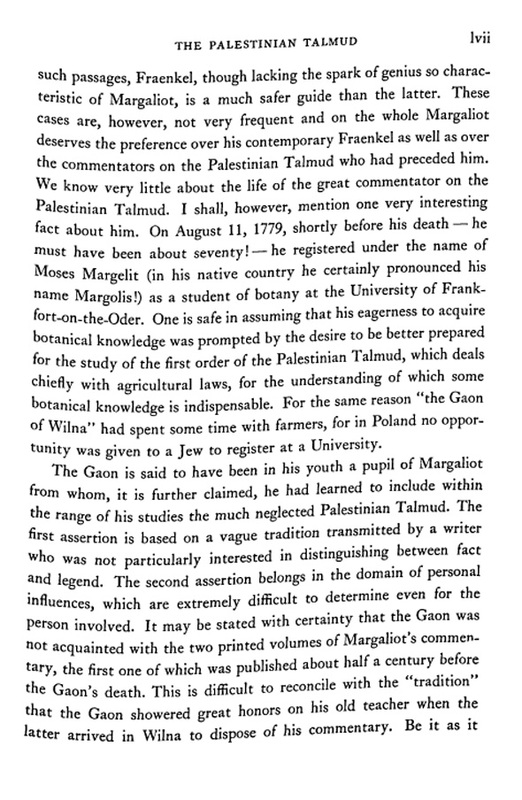 If this is indeed our M. Margoliot then shortly before his death, at the age of about 69, he registered as a student of botany presumably because he hoped thereby to gain a better understanding of the first order of the Palestinian Talmud which deals chiefly with agricultural law." Presumably the fact rests on the university record. But where is the university record? Obviously it must have been published somewhere, and indeed it has. Ginzberg (and everyone else) most likely saw it in a 1923 article, which I am going to show and excerpt - but through the miracle of modern digitization technology I can first show you the 1923 article's source. Here's what we learn. On August 11, 1779 "Moses Margelit Rubin" enrolled. His course of study was "botan." and his father was "Simon Margelit." His father's residence is Kalvarde, which could well be Kalvarija, Lithuania (which is near Kovno; in fact as close to Kovno as Keidan, where he lived when he tutored the Gra). As for the strange idea that his father's or his nationality is "Italien" (it is in the column "Heimath oder Herkunst," "Home or Descent"), this actually fits well with the Pnei Moshe. In 1765 he had moved to Italy, where he remained for years. It isn't impossible to imagine him putting down Italy in his registration. As for the name "Margelit Rubin," which I don't think he is known as anywhere else, presumably it is an attempt at giving a German version of what is after all a Hebrew word for a surname, מרגלית. Now I know that it still doesn't exactly say "The author of Penei Moshe" nor does it allude to his advanced age. Still, this is a far better than a coincidental same name. 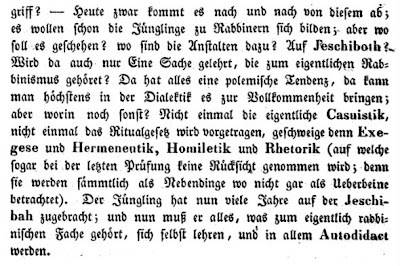 In any case, Rabbi Louis Lewin was the one who called attention to this in a really fascinating article called Die juedischen Studenten an der Universitaet Frankurt a. d. Oder (Jahrbuch der Jüdisch-Literarischen Gesellschaft 15 1923). 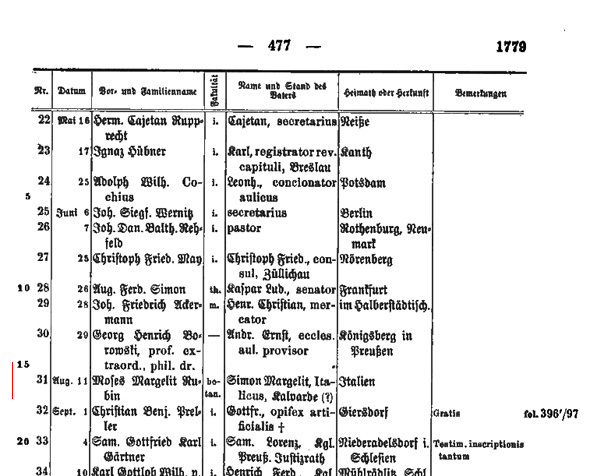 Based mostly on the aforementioned book, Louis Lewin lists all the Jewish students of the University of Frankfurt a.d. Oder in the 18th century and as much biographical information about them as available. As far as I'm concerned there is a good chance that this is the Penei Moshe, better than I'd thought. Certainly the weak link is extrapolating his motivations and stating them with certainty, but on the other hand it is doubtful that this 69 year old master of the Jerusalem Talmud registered for botany classes so that he could study tulips and start his own garden. Furthermore, if he died in 1780 then there is no telling how much time, if any, he actually spent there, certainly not enough to say that he "spent no little time in the Department of Botany." No, the evidence is definitely not solid, and the critical point is indeed whether the Moshe Marg. mentioned as enrolling at U. of Frank. am Oder is the same as the author of Pnei Moshe. That sounded pretty convincing to me a year ago, but of course this is an expert on Yerushalmi, not an expert on German university registration records, and I don't know if he even saw the entry. To me it sounds like he thinks that it simply says the name, but as I have shown it also has the father's name, mentions his place of residence and origin very close to an area of Lithuania where he is known to have lived, and also mentions his Italian collection, although this is unclear. To me this is a more pregnant piece of evidence than a mere name. There is an article on the Penei Moshe in the Proceedings of the 11th World Congress of Jewish Studies called ר׳ משה מרגלית ופירושו פני משה על התלמוד הירושלמי, by Aviad Hacohen. I haven't seen it. He must discuss this. Maybe he brings additional facts, maybe he concludes differently from me. Although I will probably track down the article to see for myself, I think it's likely that my conclusion will be what it is: a less quasi-factual fact then I thought, and more likely a factual fact. Still, one wishes there was at least one more piece of evidence and I can understand if someone is less persuaded. 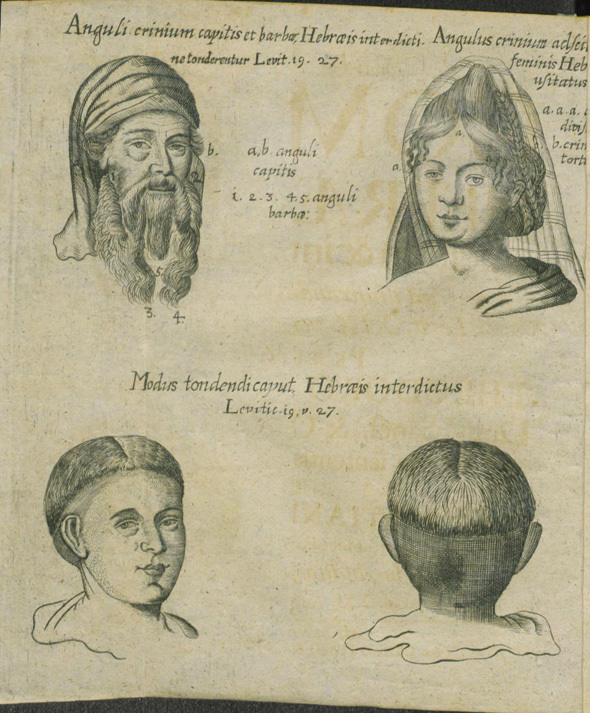 Here's an interesting illustration from a 1695 book on the biblical prohibitions of various kinds of shaving called 'Comam Hebraeorum licitam & interdictam,' or, Lawful and Forbidden Haircuts of the Hebrews, by Theodorus Dassovius. The illustrations show the parts of a man's beard and sides which are forbidden by Leviticus 19:27 to cut. I can't make out the full caption for the woman, but I'm assuming that Dassovius does not assume, unlike rabbinic law, that women are exempt from this prohibition and therefore illustrates how he sees the prohibition on the hair of a Jewish woman. Below them is the specific kind of haircut that, according to him, Leviticus 19:27 forbids. In the book everyone from Alshech to Martin Luther is cited. Shadal series #4 - disapproving of R. Samson Raphael Hirsch's predilection for German. One the things which really annoyed Shadal was German. 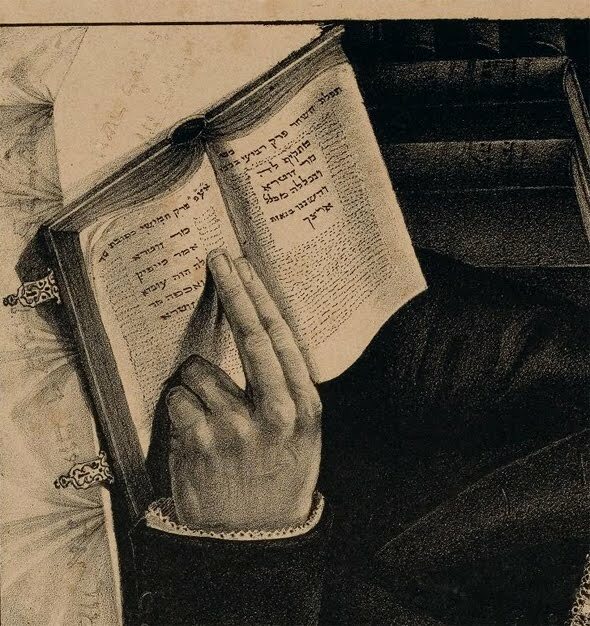 He didn't like it, he claimed that he couldn't read the Blackletter type well, he often said that he never read a complete German book until 1829, and although he wrote hundreds of letters in Italian, French and even Latin, when a Jew sent him a letter in German, he invariably answered in Hebrew. Although he did write articles for publication in German, his attitude was generally negative toward that language, corresponding to his perception that German Jews were becoming too assimilated and too cavalier toward Hebrew (shared by many non-German Jews of a traditionalist orientation all over Europe; indeed, in eastern Europe a modern Jew was often called a דייטשער, that is, a German, in Yiddish; and, ironically, in German). 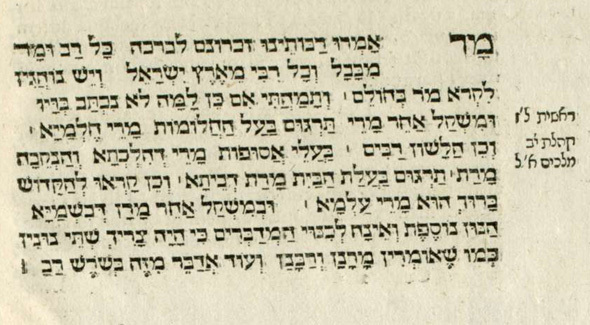 Having recently posted about Shadal's reception of Hirsch's 19 Letters (written in German; Shadal was impressed by it and expressed love for its author, who was then unknown to him), here is an interesting little poem that he wrote, apparently in response to a letter he received from Rabbi Hirsch written in . . . German. What's up with the author of the Letters Ten-Plus-Nine? Has he switched and become Geiger or Holdheim? Not in the language of Jerusalem and Judea. At the end of the book (compiled by his son Isaia) is an index stating where and if the poems in this collection were written or printed. This one? It was a ditty included in an 1847 letter to Geiger! Unfortunately the letter appears neither in Iggerot Shadal or Epistolario, so I don't know what the rest of the letter was about. On the Napoleon Tisha B'av legend - tracing it back in print to 1891. Indefatigable medieval traveler Benjamin of Tudela recently posted about "Napoleon and Tisha Be'av Myth," or the story that Napoleon visited a synagogue in [usually Russia, but I've also seen versions which say Paris] on Tisha B'Av. Noticing the lamentations and expressions of mourning of the Jews, Napoleon asked the very question that a didactic folk tale would require him to ask: What's up with the Jews? It was explained that they are mourning for the destruction of their Temple. As per the requirements of the story, Napoleon asked when this Temple was destroyed. Informed that it was 1700 years earlier, Napoleon said that if indeed this people is mourning their Temple after 1700 years, such a people so attached to their history, will indeed be restored to their land and their Temple rebuilt. Or some such thing. Benjamin of Tudela mentioned that in a search for the origin of this story, he came "across this very same question, posed to J. David Markham - President of the International Napoleonic Society . . . The noted historian of Napoleon answered that he had never heard that story. You can draw your own conclusions." While there are many reasons why the story is probably only a story, it is a story, and the question is how old is it? And are there variations? To me it's a pity that the president of the International Napoleonic Society should have never even heard of the story, since I would think that the folklore and legends surrounding Napoleon should be of interest and known to him. And this is definitely a piece of Napoleon folklore. Benjamin cited a book from 1954 which has the story, but has Napoleon not really getting it at all. In this version Napoleon is skeptical that mourning and lamenting will accomplish anything, but the author writes that he was mistaken - those who mourn the destruction will see it rebuilt. In 1946 the YIVO Annual (Vol. 1) printed an English excerpt from the 1942 book Yidn in Frankraykh by Shmuel Zanvil Pipe called Napoleon in Jewish Folklore. The article contains 43 pieces of Napoleon folklore collected from "correspondents from all parts of Poland, as well as several from Palestine and one from Bagdad, Irak." It gives two versions of the Napoleon legend. The first is as I described, and the second is an elaboration of the 1954 version mentioned by Benjamin. In this version, Napoleon visits a synagogue in Vilna and cannot understand what wailing will accomplish. Seeing the lamentation, which he considers aimless, Napoleon points to his own sword and says "This is how to redeem Palestine." Getting a little earlier - this article in the American Jewish Yearbook 26 (1924) pg. 306, translates a Yiddish article from January 1912 in a periodical called Warheit, and includes the legend - the version where Napoleon tells them that they will not regain the land by lamentation, but by force. This Yiddish article is all about how Jewish boys should join the Boy Scouts, mind you. It existed in the 40s, it existed in 1912. Obviously the story was around. We cannot be sure of how old it is, and one version seems possibly to have been compromised by Zionist sentiment. To be sure, we cannot say if the Zionist version is the original, and the other version a pious retelling of that, or if the opposite is the case. In fact it is such an aside that the author of this piece doesn't even mention the contents of the story, only that he recalled Napoleon's words on Tisha B'av. On the one hand this is good. To be so flippant shows that it was perfectly well known in 1891, a cliche to the point that it only needed to be alluded to. On the other hand, we are unsure what Napoleon's words were, although if I had to guess from the context it is the version where Napoleon advocates force rather than passivity. The Corfu esrogim controversy in this context refers not to the grafting issue, or high prices, but to the 1891 blood libel, which raised the issue of economically supporting antisemites. In any case, the point seems to be that some version of this legend must have existed for some time, perhaps decades, before 1891. If an earlier source in print should turn up, I'll keep you posted. On writing 'Elohim' with a heh or a kuph; an early, negative assessment of Louis Loewe. Rabbi M. Torczyner has a post about why he prefers to write "God" as "Gd" (link). I don't agree with him, but I certainly agree with having reasons for doing things. It reminded me of something in two fascinating letters in איגרות סופרים (Vienna 1929). Before I get to the letters, let me preface it by explaining that the aforementioned book is a compilation of documents and letters to and from Rabbi Akiva Eger and the Chasam Sofer, as well as some of their children, the two rabbis being the grandfather and great-grandfather of R. Shlomo Sofer, who edited this volume. Dots appear above some of the letters in the book title ('Letters of Writers') showing that the title is allusive to the last names Eger and Sofer -איגרות סופרים- of his ancestors. The letters are from Rabbi Solomon Hirschel of London to the Chasam Sofer who, incidentally, was the Chasam Sofer's relative by marriage at the time. If you are interested in this complex marital relationship, scroll all the way to the end of the post. "אליעזר Dr. Löwy." The young man conducted himself with great piety (והוא כמתחסד ביתר שאת). He knows ten languages, including English. He is reputed to be a big talmid chochom, and claims that he was a candidate for rabbinic positions in Altona and Cassel. Although he had visited the Chief Rabbi a number of times, they had never spoken in learning. Only recently the man's friends had rebuked him, saying that he must visit the Av Beis Din, who would love to discuss Torah with you. So it was that two weeks prior he came, and presented the Chief Rabbi with a pamphlet he'd written, which included pilpulim concerning various Torah topics. When the Chief Rabbi tried to discuss what he'd written, the young man excused himself saying that he had a headache. After he left he noticed in the pamphlet some biographical information about the young man, and the fact that he received semicha Morenu from the Chasam Sofer. It further stated that he had studied secular subjects in Vienna for three years. Given all that is occurring these days (an allusion to Reform and such), and as he claims to ordained by the Chasam Sofer, he wishes to know what sort of man he is. Was he a proper student? Was he learned and sharp? Can he be trusted that he wrote the pamphlet - as opposed to them being left over from his father's writings? If he is appointed to a position of authority, can he be trusted not to implement reforms? He further explains that it's amazing to see a young man who is so pious, who knows many languages. He therefore asks the Chasam Sofer to tell him what the man is all about. He closes by giving a testimonial of conduct of his own, telling the Chasam Sofer that "Dr. Piner" (i.e., E.M. Pinner) conducted himself entirely appropriately when he was in London, and it would have been better if the Chasam Sofer had left him alone (i.e., instead of knocking him). 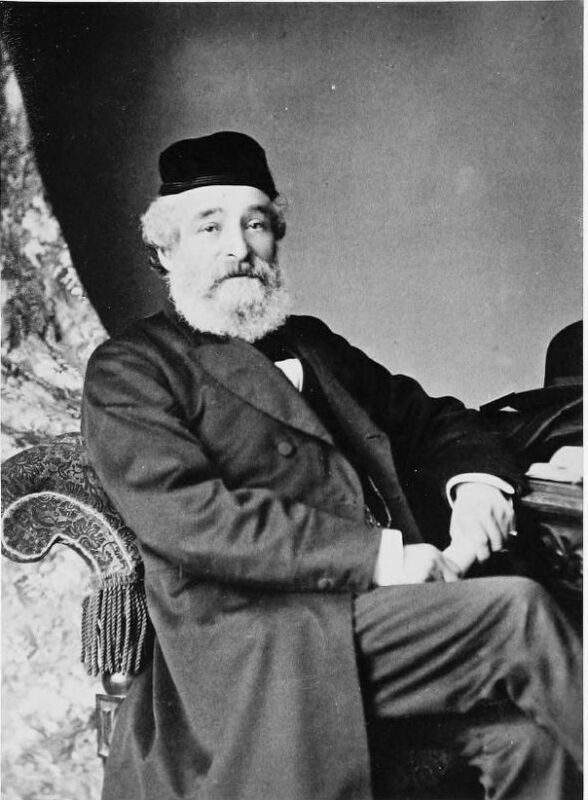 Before I get to the second letter, I will point out that"אליעזר Dr. Löwy" is none other than Louis Loewe, who would soon become the secretary and interpreter of Moses Montefiore, accompanying him on his trips to the Middle East and Russia. 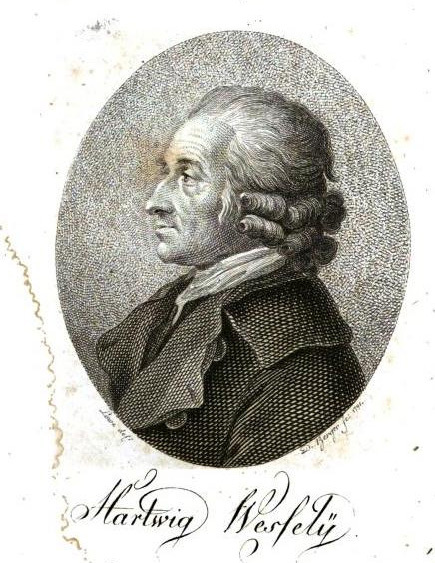 In addition to writing many scholarly monographs, he also translated Isaac Baer Levinsohn's Effes Damim (against the blood libel) and part of Haham David Nieto's Matteh Dan (as part of the polemic against Reform in England), and eventually he published some of the diaries of Moses Montefiore. In addition, he was the first Principal of Jews' College. In any case, it doesn't take too much imagination to see that the Chief Rabbi Hirschel wasn't taken by this young man, who acted so piously, was so educated, was cultivating an amazing reputation in London, and wasn't exactly paying a great deal of courtesy and respect to himself, who was almost fifty years his senior. 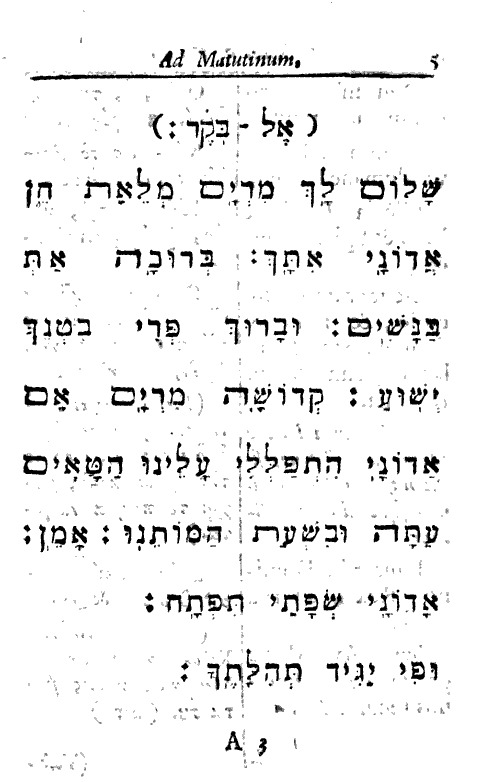 The second letter in Iggeros Soferim is a response to the Chasam Sofer's reply. Although we do not know exactly what he replied, it is apparent that he basically said there was nothing wrong with Loewe as far as he knew. Not necessarily a ringing endorsement, but certainly if Hirschel was looking for something negative it was not given to him. So in his reply to this letter, he tries again. He zeroes in on the Chasam Sofer's words that he saw nothing bad openly (assuming this is a direct quote - לא נראה ממנו רע בפרהסיא) and asserts that the Chasam Sofer must have decided to be nice and not go into detail about what is bad about Loewe. He continues that it's really bad for a person to act outwardly piously but conceal his negativity in his heart. I'm not exactly sure what to make of what appears next, but it seems that Hirschel took the following as evidence that Loewe was "concealing." He writes that he had been "concealing" his rabbinic diplomas from him, until Loewe's friends convinced him to show them to him. So he saw his semicha from the Chasam Sofer (called עטרת בחורים, presumably because he was unmarried) as well as a התרת הוראה from two others. Apparently he felt the language in these diplomas were over the top, and that perforce such a young man could not be such a great scholar. Furthermore, when Loewe showed him something else he had written - in London - he once again declined to discuss it with him, sort of fumbling with the pages and saying that he wasn't well. Up to this point he has yet to discuss a word of Torah with him. Apparently Hirschel had found irrefutable evidence of Louis Loewe's deficient piety. Furthermore, writes Hirschel, what does the Chasam Sofer have to say about this? What does he think of the piety of a man who writes אשר חנני אלקים with a ה instead of a ק? Is he not guilty of transgressing the Third Commandment לא תשא? Apparently Hirschel had also heard rumors, because he then asks the Chasam Sofer to do him a favor and tell him what happened with Loewe and the police in Vienna. Evidently realizing that he sounded like he was in a persecuting mood, if not paranoid, Hirschel then tells the Chasam Sofer not to be concerned that he's going to be hard on Loewe, he will not "repulse him with two hands," because he is not like that. He closes by asking the Chasam Sofer not to write letters for people without researching them thoroughly ("sifting thirteen times," to use the Talmudic idiom as he does). Anyway, this is the general content of these most curious letters. 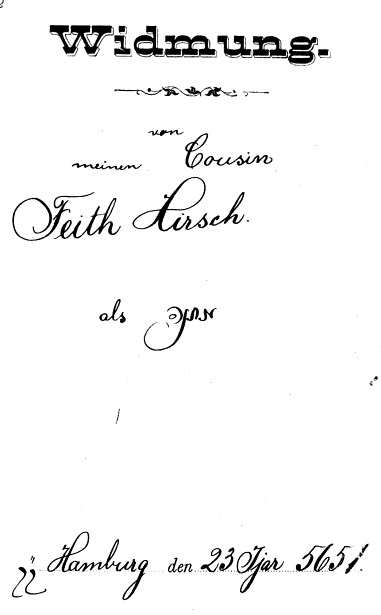 Hirschel's daughter Fanny married a grandson of Rabbi Akiva Eger in 1827, although the marriage ended in divorce in 1837. As a grandson of RAE, the husband was therefore also a nephew of Rebbetzin Chasam Sofer, being a daughter of RAE. Thus, upon marriage, Hirschel's daughter became a niece of the Chasam Sofer. Rabbi Hirschel was noted at the time for his prestigious rabbinic post, piety, scholarship, yichus, and wealth, not necessarily in that order, and his was therefore a highly desirable family to marry into (his being the brother of Saul Berlin was evidently not such a black mark). Artscroll's grammatical correction of the Bobover Rebbe. In the Artscroll edition of the Kinnos (The Complete Tisha B'Av Service) there is a kinnah for the Holocaust by Rabbi Shlomo Halberstam, admo"r of Bobov. Artscroll included the Bobover Rebbe's account of how he came to write this kinnah. For decades he felt unworthy of writing one until he happened across this passage in Seder Ha-yom, which states that whoever can compose kinnos should do so. As a public service Artscroll makes this kinnah available for free download (link). I noticed something interesting. In the translation one Hebrew phrase is transliterated into English rather than translated. But obviously "Roshei Yeshiva" is not exactly a transliteration of "ראשי ישיבות." It is surprising that Artscroll not only chose to make a grammatical correction but to do it so visibly. (If anyone is curious, in the Otzar Ha-chochma "roshei yeshiva" returned 795 results, "roshei yeshivos" returned 2890 (both spelled in Hebrew, of course). I'd say this makes a decent case that "roshei yeshivos" is acceptable rabbinic Hebrew. Included in the "roshei yeshivos" users were people like R. Yaakov Emden, and Italian rabbis like R. Samson Morpurgo and R. Aviad Sar Shalom Basilea, who knew about grammar. 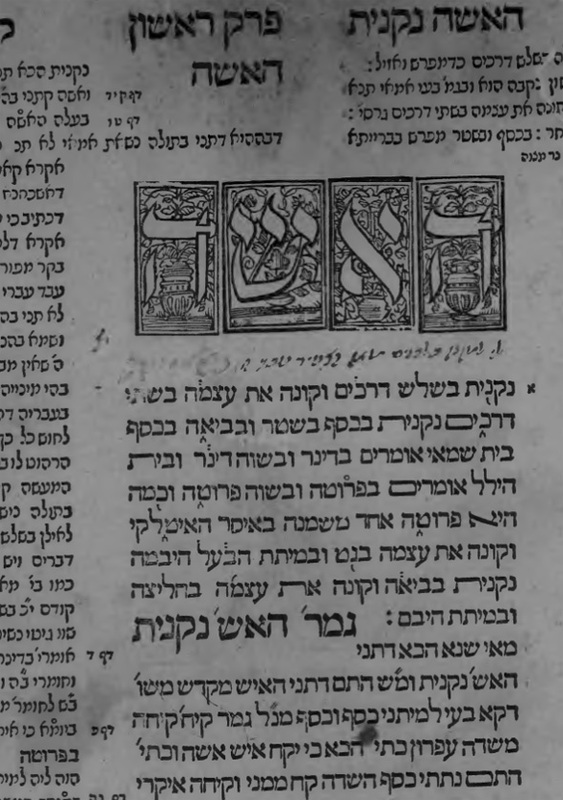 Here's a page of the 1553 Sabbioneta edition of Kiddushin, which included cantillation symbols for reading the Mishnah. 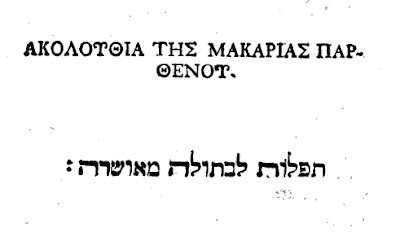 The editor explained on the title page that cantillation marks were added וכלפי מה שאמרו רז"ל סוף מסכת מגילה דהקורא בלא נעימה ושונה בלא זמרה עליו הכתוב אומר וגם אני נתתי להם חקים לא טובים ומשפטים לא יחיו בהם נתאזר עז לתת הטעמ"ים במשני"ות כדי להחזיר העטרה ליושנה וצדקה וטוב וחיים יהיה לנו כי נשמור ללמוד המשניות כאשר צוו אותנו חכמינו ז"ל.